In what has been described as “Late 20th-Century Structuralist” style, this amazing modern house in Sydney, Australia was designed by Undercurrent Architects to respond to the raw Australian terrain. 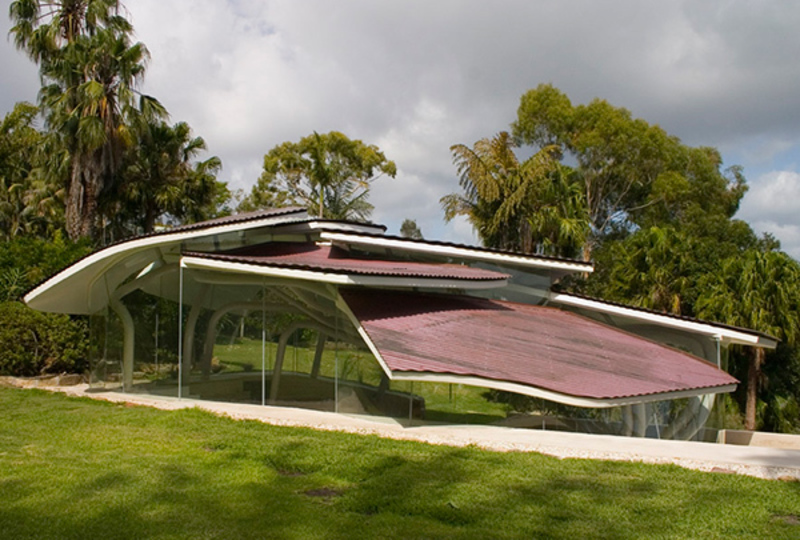 This artist’s studio, an addition to the existing main house, reflects nature with its layered leaf-like corrugated copper roof, held up by wildly twisting root-reminiscent steel columns, and wrapped in 3-D curved glass that blurs the boundary between indoors and out. This contemporary, nature-inspired space enjoys views of the ocean and the landscape, and apart from its use a work space, is a favorite spot for meditation, yoga and as a guest retreat excavated beneath the bedrock. Undercurrent Architects photo credit: Hugh Rutherford trendir. com is an up-and-coming community of people specialized in high-quality and on-trend cool projects and tutorials in home design, fashion, and crafts. Recognizing the value of the do-it-yourself movement of the last several years, trendir. com is inspired by unique yet replicable ideas.